Kick your brain health up a notch with this veggie and white meat filled chicken burrito. The avocado spread is jam-packed with potassium, healthy unsaturated fats, and dietary fiber. Plus, it is loaded with vitamin C, an antioxidant which may boost your immunity and keep radical damage to your cells at bay. The lean, shredded chicken breast is seasoned with anti-inflammatory spices—cayenne and smoked paprika—for a flavorful punch and the sprinkle of black beans provides ample amounts of dietary fiber as well as protein. Even the chopped Romaine lettuce, a leafy green packed with vitamins A, K, and potassium, is packed with brain-healthy omega-3 fats. Finally, add some additional vitamin K and potassium with cilantro leaves and chop a few red cherry tomatoes for a burst of red color and to further amp up the vitamin C, potassium and antioxidants from lycopene. 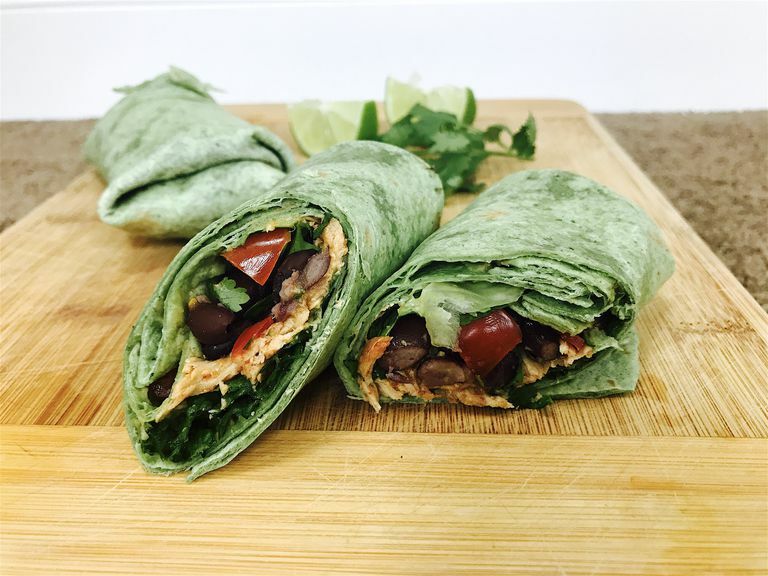 If you haven't gotten the picture yet, every single ingredient in this healthy chicken burrito recipe gives your body something good! Put cayenne, paprika, turmeric, salt and pepper in a medium bowl. Mix together and add chicken breasts. Coat on both sides. Place chicken into the slow cooker/pressure cooker bowl. Add vinegar, water, Worcestershire sauce, tomato paste, sugar. (Alternative: bake chicken in the oven at 350 degrees for 30 to 40 minutes or until internal temperature reaches 165 degrees). Cook in slow or pressure cooker according the directions. Shred the chicken with two forks and place in a bowl with the sauce. Place each tortilla in a skillet over medium heat for 30 to 60 seconds, until warm. Spread each one with a thin slice of avocado, covering the whole surface. In the center of the tortilla, evenly divide the ingredients among 6 tortillas; add shredded chicken, beans, lettuce, tomatoes, cilantro, and a squeeze of lime wedge. Fold the two sides into the center than pull the bottom half over the ingredients and tuck it under and cover with the top half of the tortilla to make a tight burrito wrap. Alternatively, you can make this burrito with pulled pork or baked tofu for a different protein source. Any veggies or fruits will work, too. Feel free to add mushrooms, garlic, onions, zucchini, bell peppers, or tomatillos. For a twist, add a hint of shredded cheese or a dollop of plain yogurt. Toss in kidney beans, pinto or white beans instead of black beans. In lieu of cilantro, use fresh basil or parsley to vary the herbal accent. Serve immediately with sparkling water with lime. If not eating right away, wrap burritos in foil or parchment paper and keep warm in the oven. Refrigerate the remaining burritos overnight. To reheat, all you have to do is put it in the microwave for 30 seconds or in the oven for 10 minutes at 350 degrees.